Going into the weekend, many box office prognosticators were wondering if director Ridley Scott's The Martian could break the October opening weekend record set two years ago by Gravity, which earned $55.7 million in its first weekend in theaters. As it turns out, The Martian gave a valiant effort, but came up just short, taking in an estimated $55 million, according to Box Office Mojo. Of course, the film is still in great shape, earning back nearly half of its $108 million budget after just three days in theaters. The Martian was widely beloved by critics, earning a 94% fresh rating on Rotten Tomatoes, opening in 3,831 theaters for an impressive $14,357 per-screen average. If these estimates hold true when the actual numbers roll in tomorrow, The Martian will have fell just $700,000 short of Gravity's October box office record, but it is still an impressive showing nonetheless. The Martian was the only new movie opening wide this weekend, easily dethroning last weekend's winner, the animated sequel Hotel Transylvania 2, which dropped to second place with $33 million, just a 31.9% drop from last weekend's $48.4 million debut. Ridley Scott's sci-fi drama has been winning over critics ever since its world premiere at the Toronto International Film Festival earlier this month, with some even calling it the best movie of the year, so far, following the quest to save an astronaut stranded on Mars. We still have a long way to go until the awards season races truly start to heat up, but The Martian has emerged as one of the top front runners. 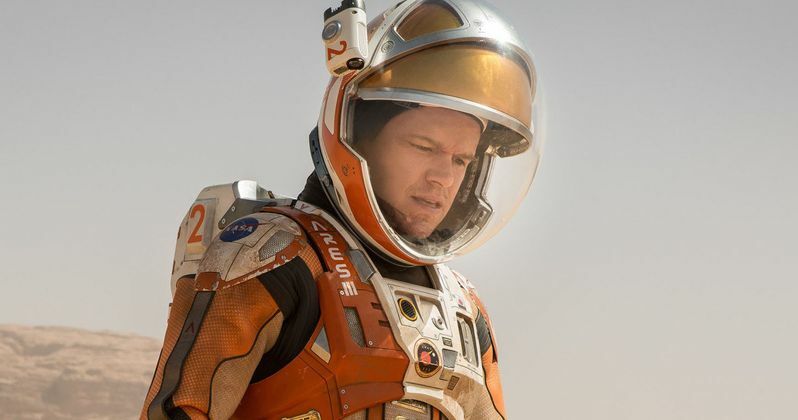 With an all-star cast including Matt Damon, Jessica Chastain, Kristen Wiig, Kate Mara, Sebastian Stan, Sean Bean, Michael Peña, Chiwetel Ejiofor and Jeff Daniels, The Martian has a shot to continue the tradition of outer space movies that are both financial and critical hits, including Gravity and Interstellar, which opened in the same frame the past two years. Related: Can The Martian Hold Off Burnt & Scouts at the Box Office? While The Martian was the only movie debuting in wide release, this weekend also brought the nationwide expansion of the critical darling Sicario, which rose from 10th place last weekend to third place this weekend with $12 million. The drama expanded to 2,620 theaters, with a solid $4,609 per-screen average. The film, which features an all-star ensemble cast including Emily Blunt, Benicio Del Toro, Josh Brolin and Jon Bernthal, has now earned just over $15 million after three weeks in theaters, from a $30 million budget. The drama has already been considered an early Oscar favorite for Best Picture and several other categories, but we'll have to wait and see how it fares once the nominations are announced in January. The Intern dropped from second place to fourth place this weekend with $11.6 million ($36.5 million overall), with The Maze Runner: The Scorch Trials rounding out the top five with $7.6 million ($63.2 million overall). The Intern only dropped 34.5% in its second weekend, but it remains to be seen if it can keep up this solid pace at the box office in the weeks to come. The dramatic comedy features an ensemble cast that includes Robert De Niro, Anne Hathaway, Rene Russo, Anders Holm, Andy Rannells and Adam DeVine. Rounding out the top 10 is Black Mass ($5.9 million, $52.5 million), Everest ($5.5 million, $33.1 million), The Visit ($3.9 million, $56.9 million), War Room ($2.8 million, $60.5 million) and The Perfect Guy ($2.4 million, $52.6 million). Falling just short of the top 10 this weekend is The Walk, which opened exclusively in 448 IMAX theaters this weekend, taking in $1.5 million, with a solid $3,460 per-screen average. The film expands nationwide next weekend, so it will surely find a spot in the top 10 one week from today. Looking forward to next weekend, Warner Bros.' Pan is the only new wide release, with The Walk expanding nationwide. Opening in limited release is the highly-anticipated Steve Jobs, starring Michael Fassbender, which will get a nationwide expansion on October 23, Picturehouse's Big Stone Gap, starring Patrick Wilson and Ashley Judd, Vertical Entertainment's The Final Girls starring Nina Dobrev and Taissa Farmiga and foreign films Victoria and Xenia. Be sure to check back on Sunday for the box office estimates, and again next Tuesday for next week's predictions. Until then, check out the top 10 estimates below.